It's been sitting in my "edited" box for months. I keep wanting to share it but the opportunity hadn't presented itself until now... when spring is upon us. Therefore, I want to share some warm, sunshine sunset shots up on a mountain to make your mouth water. 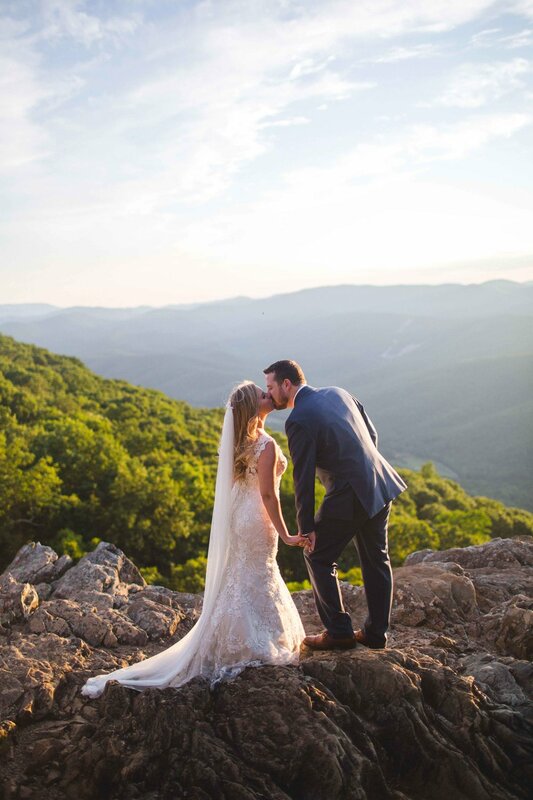 Ashley & Mark were married back in June 2017 and shortly after their wedding, we decided to make a trip to Raven's Roost to take adventurous pictures in their wedding attire. BRILLIANT IDEA. With a little bit of a drive & no hike involved, I was able to be in the middle of those gorgeous blue mountains without working so hard for it like I normally do when hiking McAfee Knob. Let me tell you, I'll gladly make that drive for this view (and I think everyone else would too). When we arrived, the overlook was packed but when a bride walks up in her dress, people tend to move out of your way pretty quickly and watch from the sidelines. 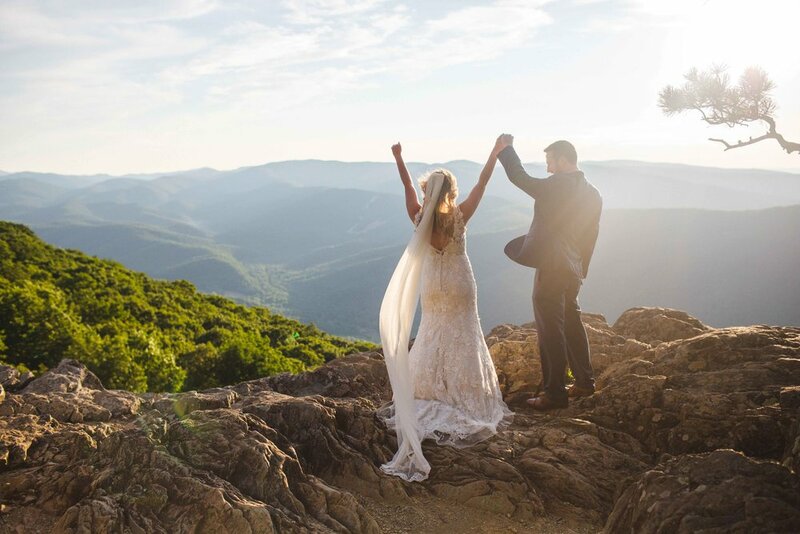 The snuggled, they danced and that veil was an adventure in itself but, it was worth every bit of hassle for the final rays of sunshine that kissed their cheeks. And that dress.... UGH! Ashley's silk slip dress with a lace overlay from Allure complimented her cathedral veil and Mark's navy blue suit for a summer's eve. 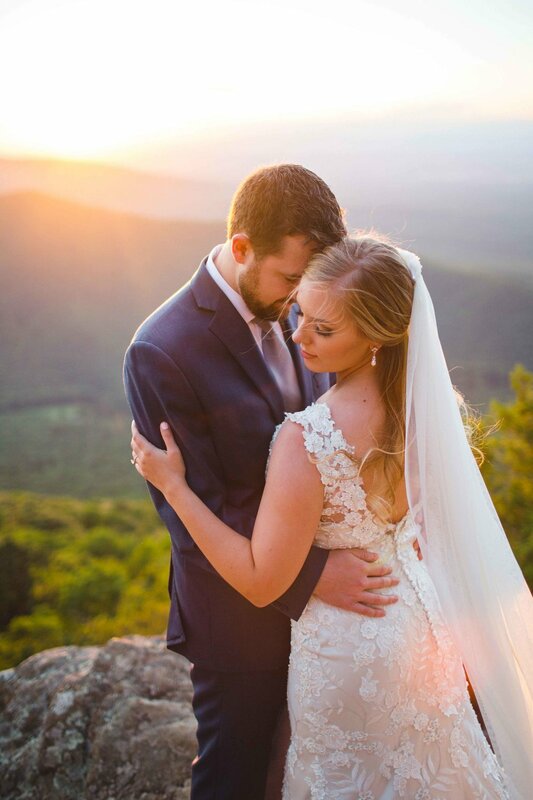 There's nothing like the golden glow from a Blue Ridge Mountain sunset and this shoot proves it.